After a nearly two-hour downpour over Osheaga's new site on Île Sainte-Hélène, the sun came out for Sampha. Taking to the stage in a haze of purple and blue smoke, Sampha Sisay opened with "Timmy's Prayer," from his critically acclaimed Process, to a sombre crowd (mostly) wearing ponchos. After an entire day of cancellations and delays due to terrible weather, Sampha's presence — and outstanding vocals — instantly soothed the discouraged audience. Taking off the sleeves of his jacket to reveal that, yes it indeed had secret straps allowing for it to hang off him like a backpack, Sampha and his equally stylish backing band went into "Under," and then "Reverse Faults," moving their way through the album's track list one by one. While his voice filled the expanse of the festival grounds effortlessly, his performance was intimate, as if he were playing a small club rather than a large music festival. 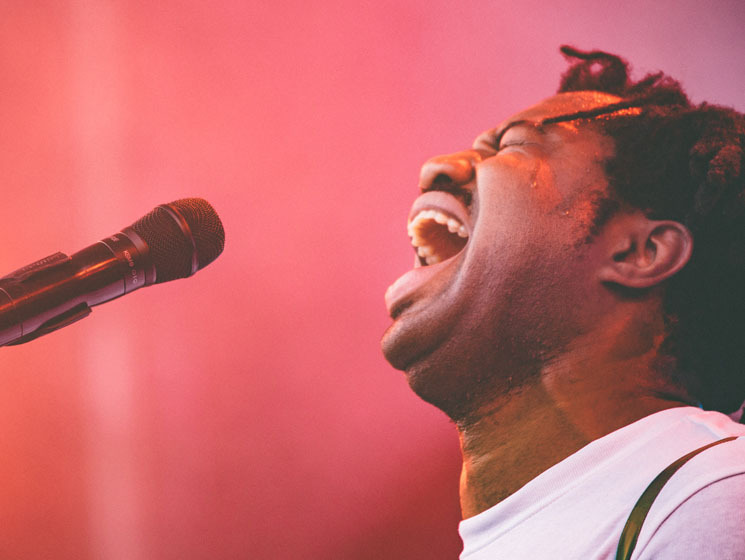 Moving about the stage in bouncy steps, Sampha's quiet charisma propelled him onward at a graceful pace, playing "Too Much," and then "Plastic 100°C"; the lights flickered blue and white, making it seem like his voice was emerging from the deep. Transitioning in to "(No One Know Me) Like the Piano," Sampha went solo while being bathed in angelic, white light. He kept his eyes closed for most of the song, harking back to the meditative face on Process's album cover. Ending the set with the popular "Blood on Me," his voice wavering ever so slightly, Sampha and company made sure to end the set on a booming note.